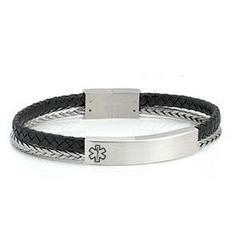 Our new designer styled leather medical ID Alert bracelet is a perfect medical jewelry choice for both men and women. It adjusts to fit wrist sizes 6.5 to 7 inches. It's length is 8 inches. It's stainless steel medical tag can be engraved with your medical alert information. The closure is a magnetic clasp which makes it easy to put on and to take off.